Online program for health professionals involved in screening of DDH; this video provides an overview of DDH and its management. Developed by Orthopaedics at The Royal Children's Hospital Melbourne. Orthokids - Melbourne Children's Orthotic Specialists. Victorian Paediatric Orthopaedic Network (VPON). Structured guidelines for the clinical management of conditions regularly encountered by health professionals caring for newborns. For use by medical and nursing personnel working in special care nurseries throughout Victoria. There is a wealth of information and resources available for orthopaedic surgeons and community based health providers via the IHDI website. We've showcased a selection of these here. For further information please visit the IHDI website. The following is an instructional video, developed by specialists at Hospital for Sick Children in Toronto. It is based on the recommendations of the IHDI Medical Advisory Board. 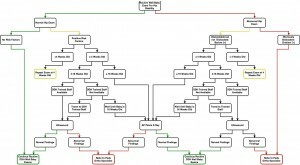 The DDH Diagnosis Pathway, above, was approved by the Medical Advisory Board of the International Hip Dysplasia Institute (IHDI) in December, 2015 after being developed and implemented by the St. Luke’s Health System of Idaho. This system of hospitals provides healthcare services for a wide region of the Northwest United States including remote regions and indigenous people. There is an accompanying Power Point presentation, on the IHDI website, which explains the basis for development and implementation. This includes a program for quality assessment and documentation of performance with outcome metrics. For more information, please contact IHDI. Late diagnosed developmental dysplasia of the hip has trebled in recent years sparkling a call for increased awareness for the condition and the avoidance of inappropriate lower limb swaddling. The Medical Journal of Australia published these findings in April 2016. The International Hip Dysplasia Institute Classification has been validated and proven more reliable and accurate than older methods. It was published in the Journal of Pediatric Orthopedics in 2014. The IHDI have conducted and/or supported a significant number of published research articles. 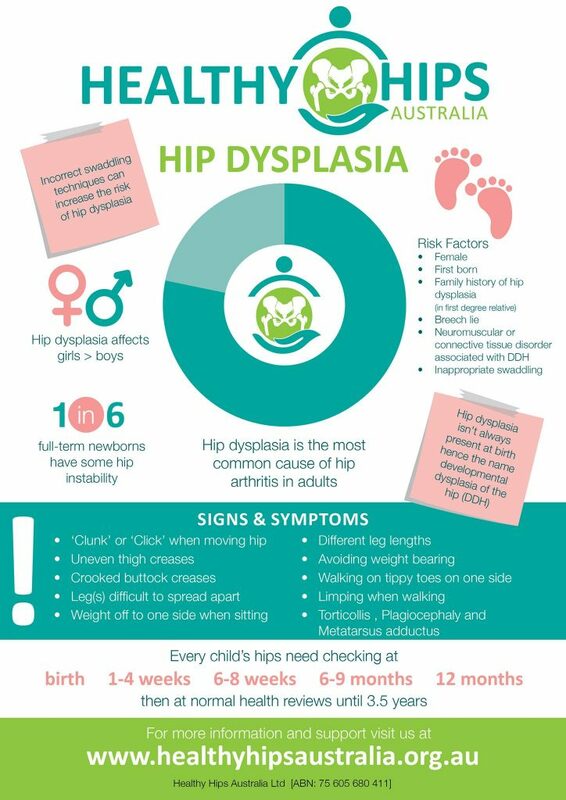 Healthy Hips Australia has developed a series of handouts, for parents, from parents who've been through a hip dysplasia journey of their own. Available here. Healthy Hips Australia aim to facilitate connecting health professionals to professional development opportunities, being run in Australia, specific to hip dysplasia diagnosis, treatment and management. Please contact us if you would like to advertise a webinar, workshop, seminar, and/or conference related to hip dysplasia. Please contact us if you have a query about training or would like to offer your services in running some training on behalf of Healthy Hips Australia.